To set the record straight about our first Matron, an entry in the MAB minutes for 14th October, 1916 tells us that WACHER Helen, 62 years, formally Matron River Hospitals and Ambulance Service, was given a superannuation allowance of £193 9s 10d per annum. As her last report was dated 5th January 1916, but her notice of resignation 22nd May, she was clearly on the sick list for the last few months. How easy was it to live on £193 in those days? Well in 1907 her salary was £150 (Dr Ricketts was on £700) and she also had a furnished house, attendance, rations, fire, light and washing, so things would have been a bit tight unless she had friends or relations to share a home with. As to how her name was pronounced, correspondence with a relative establishes it as ‘Washer’, as in dishwasher. Matron Thorpe took over in 1917, so it was she who, with Dr Cameron had to drag Joyce Green into the post-war twenties with their flappers and bright young things with bobbed hair, and the Nurses Registration Act of 1919. At first all the reports to the MAB about nurses, and their ‘hiring and firing’, seem to have been made by the Medical Superintendent, Dr Ricketts, so it is not known exactly what Matron Wacher’s powers and duties were. But if she was away for months at a time, delegation was inevitable and before 1901 this seems to have been to Miss Louisa Barton who wasn’t a trained nurse at all but a hospital housekeeper or head needlewoman. During nearly the whole of that time her duties devolved on Assistant Matron Miss Barton. He praised Miss Barton’s work and then the key sentence came, “I think Miss Barton deserves well of the Managers and I trust the (hospital) Sub-committee will see their way to recommending that she be suitably recompensed.” The Board got the message and Miss Barton £30; and while they were about it they threw in £52.10s for Miss Wacher. 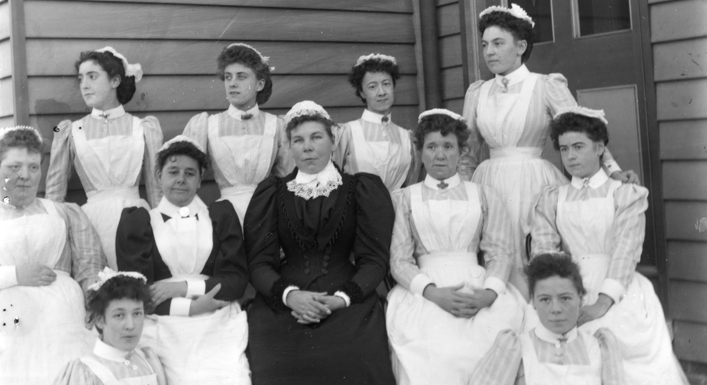 And so it came that on 7 October 1901 a Miss Cottrill was transferred from the South Eastern Hospital to the River Hospitals and the ‘exceedingly painstaking and conscientious’ Miss Barton was regraded to Housekeeper. Once again Dr Ricketts put in a good word for her and the MAB sweetened her demotion pill to the tune of £20. Miss Cottrill’s appointment was just in time, for the country’s last major outbreak of smallpox had just started. As for Miss Barton she stayed on as Housekeeper at the River Hospitals till 1908 when at the age of 53 she was superannuated for an undisclosed allowance. Her appeal for more was turned down.